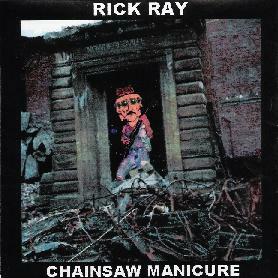 Rick Ray - "Chainsaw Manicure"
Rick Ray is back with another CD. This was recorded in 2004 in his home studio and he plays all the instruments except for the reeds which are played by Rick Schultz, as always! "Reality Replaces The Symbol" starts the CD off slowly with some guitar sounds, before some speedy soloing and then the main riff and song begins. Very cool and concise lyrics are presented. The vocal delivery alters between a deep spoken word section (reminds me a bit of the vocalist Hans for the Swedish band, The Moor) with a dark guitar, into a more melodic section with more normal vocals. The guitar soloing is very cool with lots of alternation in the effects used. "Leave It Unsaid" is a melodic fast paced rocker again with vocals that remind me of Hans from the Moor. The bouncy bass line gives this song a happy feeling before going into the solo section, which features really nice melodic fluid runs. "Nothing Left To Think" is really like 80's heavy metal style with the way the riff is constructed. "Just Wanted To Thank You", an acoustic number, is perhaps my favorite song on the CD. I really love the acoustic playing. On "In the Void", Rick plays some of the coolest guitar on the CD in the background as this song evolves and Rick speaks the truth about the world. "Give War a Chance" has quite a dark lyrical theme. "Threnody" is another acoustic track with a bit of a psychedelic Beatles like edge to it! "The Rhinoceros Shuffle" is a really excellent instrumental with great playing by both Ricks and a track where the bass playing really stands out. "I Love Your Stinking Guts" is also a great song and one of the strongest tracks on the CD and proves the CD is not just about shredding solos. I really like the concise lyrics on this CD and the strong sense of melodic overtones in the tracks. "Chainsaw Manicure", another instrumental track, features some really cool guitar and reminds me a bit of Frank Marino, perhaps inspired by covering "Poppy" for the Frank Marino tribute CD. The CD ends with "Nowheresville". This CD has some excellent compositions, great lyrics and guitar playing but the lack of real drums or bass really weakens some of the songs significantly. Anyway, one of the best release I have heard by Rick! For more information you can visit Rick Ray's web site at: http://communities.msn.com/GuitaristRickRay. Contact via snail mail c/o Neurosis Records; 20301 Ball Ave; Euclid, OH 44123.